This presentation is to review the Promoting Interoperability Category for the Aprima User. I will review the Promoting Interoperability measures and workflows within Aprima. This training will cover how to enroll payers through the Practice Insight® Enrollment Manager. This is where users from the practice enroll to receive ERAs from available payers and to submit claims for select payers. Practice Insight is where you can check the status of each enrollment submitted directly to Practice Insight. Activist investor Elliott Management is pressing athenahealth CEO Jonathan Bush to sell the cloud-based EHR company he co-founded in 1997. Shares of athenahealth jumped more than 23 percent on the news. Bush, who is in the midst of retooling the company, said in a statement Monday that the board of directors would “carefully review the proposal to determine the course of action that it believes is in the best interest” of the company and shareholders. To date, athenahealth has managed to fend off the circling New York hedge fund, which is headed by Paul Singer. This latest offer, to pay $160 in cash per share, comes on the heels of first quarter results that appeared to provide a slight boost for the company – although Bush acknowledged during the first quarter 2018 call with investors that there was still more “remodeling work” to do. Elliott Associates took the first step toward acquiring athenahealth in May 2017 when it purchased 9.2 percent of its stock, which at the time triggered a 12 percent jump in stock price. In an effort to ward off a takeover, Bush began to restructure in October 2017. The company cut 9 percent of its workforce, closed some offices and sold the company jet. In February 2018, athenahealth appointed former GE chairman and CEO Jeff Immelt as chairman of its board of directors. 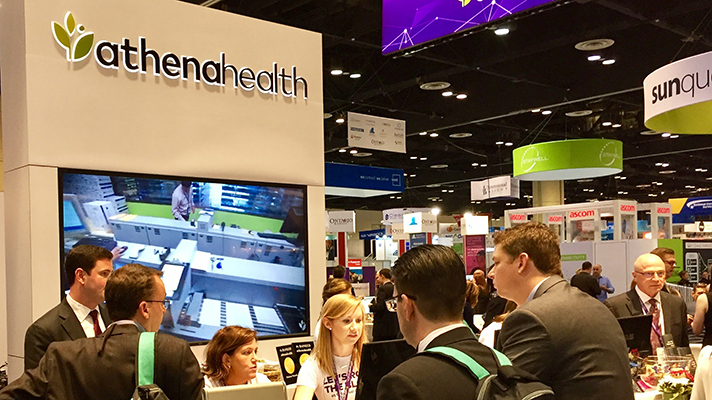 In April 2018, Bush announced an overhaul of the company’s structure, with new standalone micro-services.The company debuted Epocrates Connect, a mobile app in March at HIMSS18. The system uses machine learning and language processing to give providers information and help coordinating patient care.